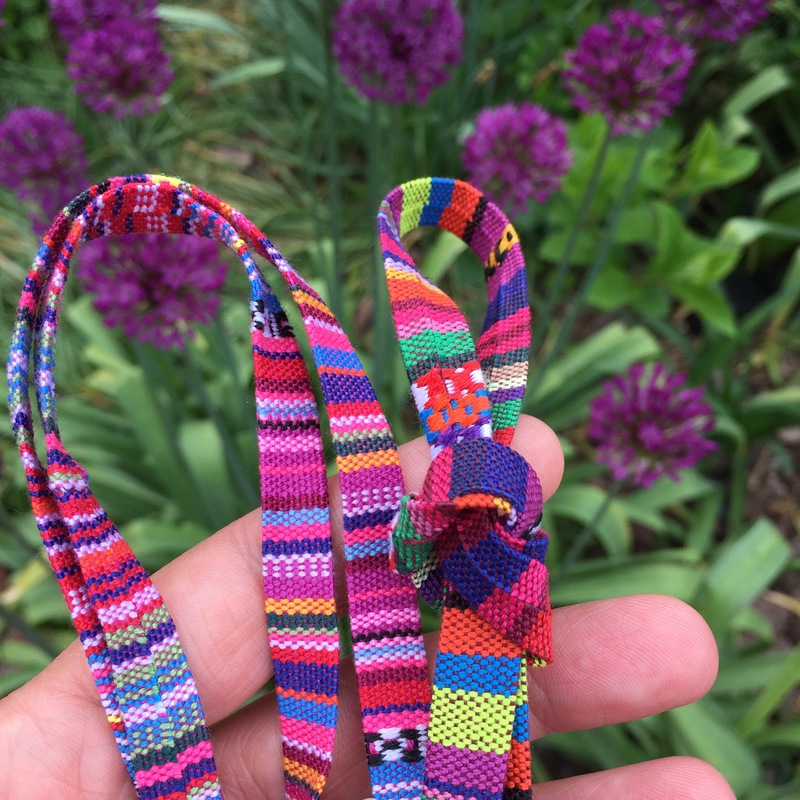 I have been working on a series of Boho Crazy Hoops, which are inspired by crazy quilts and incorporate loads of texture. Part of that texture is in the form of fabric yo-yos, which are addictively fun to make. 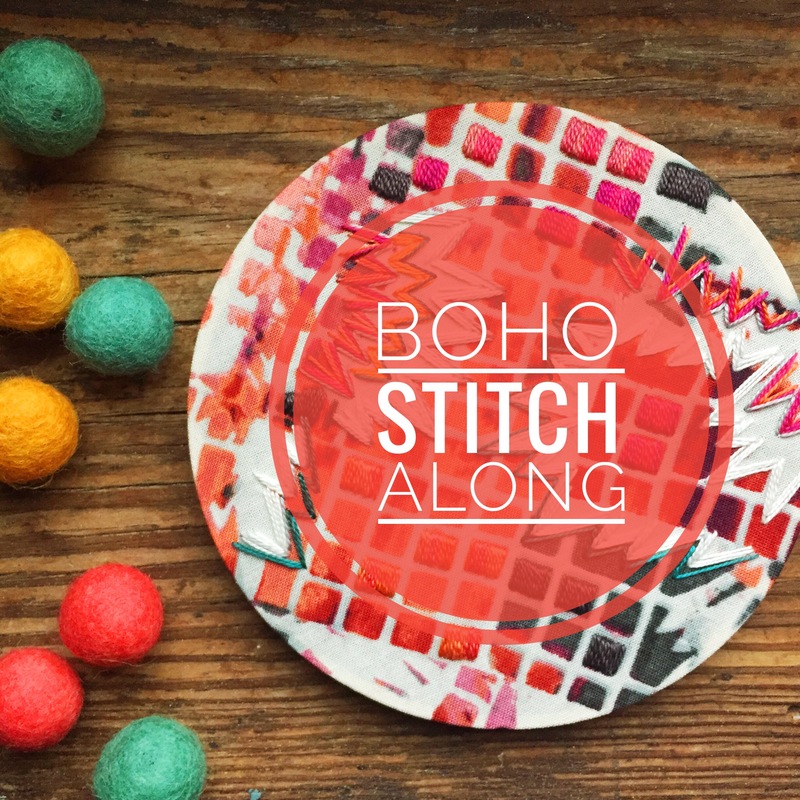 After posting pictures of these yo-yos, i’ve been asked a lot how to make them, so, without further ado, here are the super-simple-step-by-step-fabric-yo-yo instructions for you! 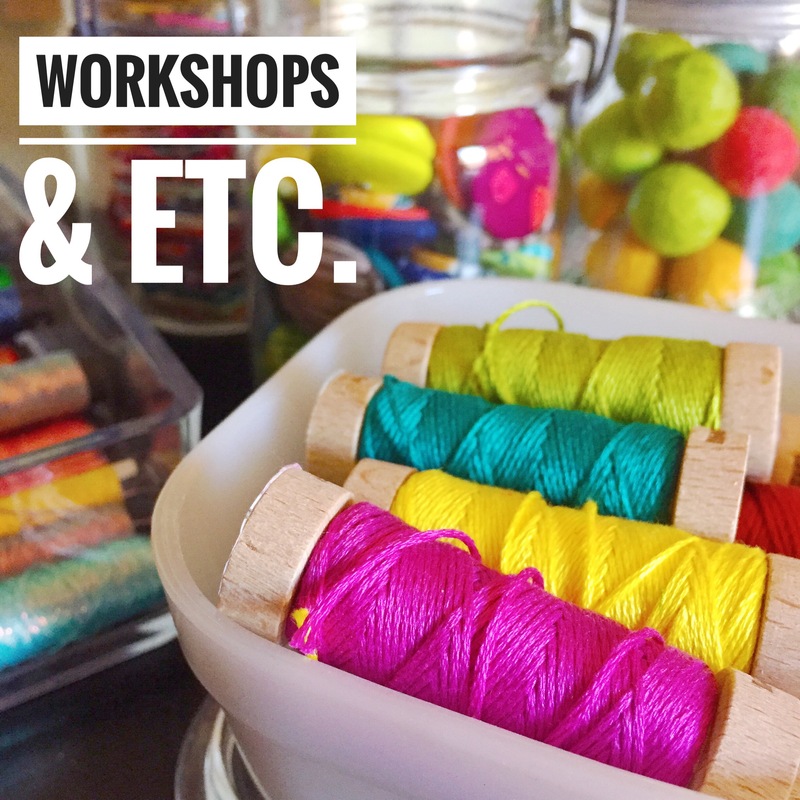 Now that you have your supplies, you are ready to make some yo-yos! Separate the Clover yo-yo maker and sandwich the fabric in between the layers of the maker. You’ll notice on the directions that it tells you to line up these lines with the little notches on the other side. That is important! This is the backside of the fabric and the backside of the yo-yo maker. See the little notches around the outside edge? Those are what will line up with the lines on the other side of the disk. This is the front side of the maker and fabric and it is what you will be looking at while you stitch. Trim your fabric, leaving about 1/2″ of fabric all the way around. Here’s a close up of the thread. 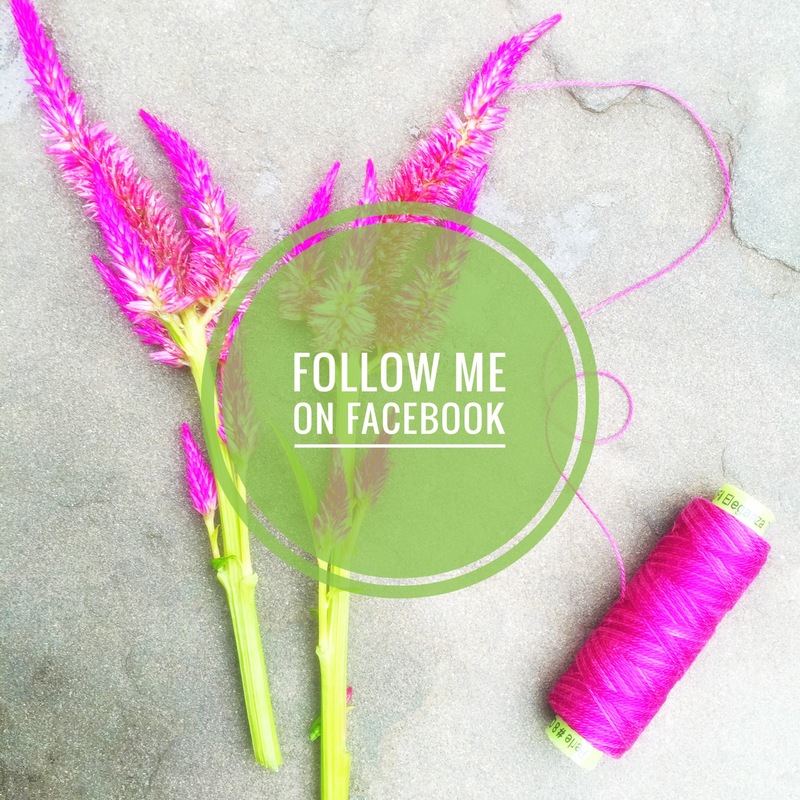 This is the thread that I use for all of my beadwork and yo-yo making! I love that it comes on a spool and that I don’t have to divide threads before stitching. Thread your needle and knot the end of your thread. Continue this all the way around until you have stitched in each slot. When you stitch your way around and you have arrived back at the first slot on the yo-yo maker, you are going to stitch that one again. 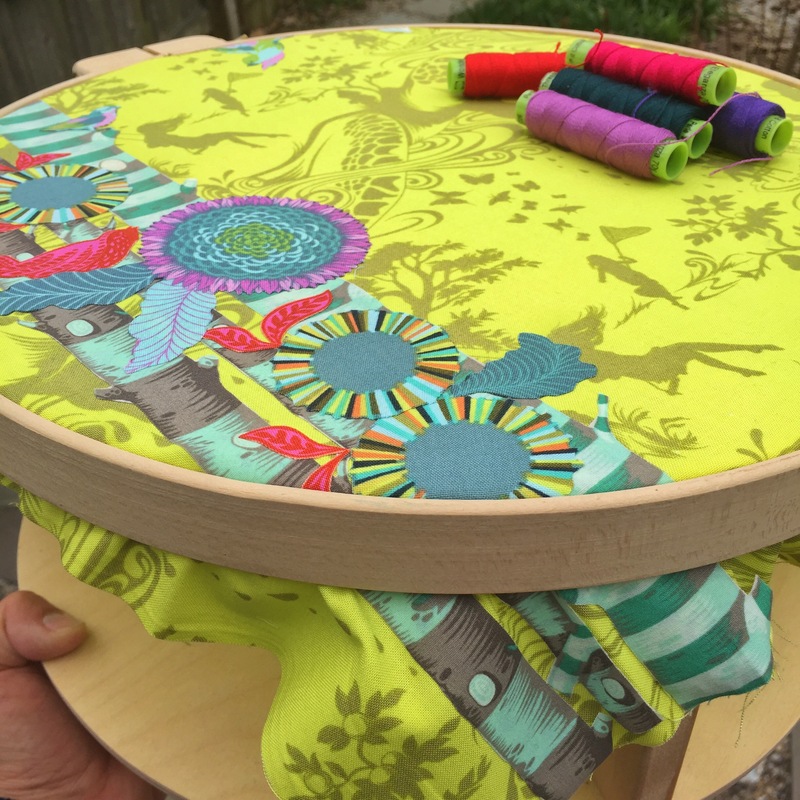 It’s time to take your fabric out of the yo-yo maker. Just pop the sections apart and gently pull your fabric off of the disk. With your needle and thread still attached, you are going to pull the fabric tight and you’ll see that it starts to bunch up. Continue doing this until you have a lovely little yo-yo shape. You will need to adjust the fabric yo-yo until it looks symmetrical all the way around. When it looks good to you, tie off your stitch. I like to make a small stitch and knot it, just to make sure the yo-yo is secure and won’t come apart. Trim your thread and you have made your first yo-yo! Wasn’t that fun?! Now picture making these to coordinate with fabrics that you are embroidering! Welcome back for Week no. 19! 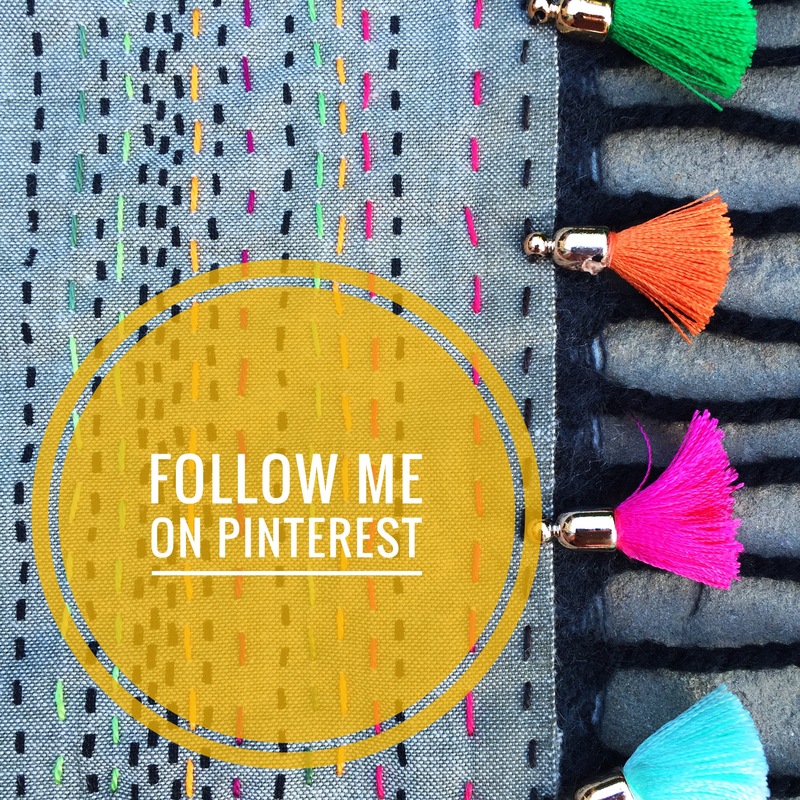 If you are just beginning a piece for the #BohoSAL, check out my previous posts here. 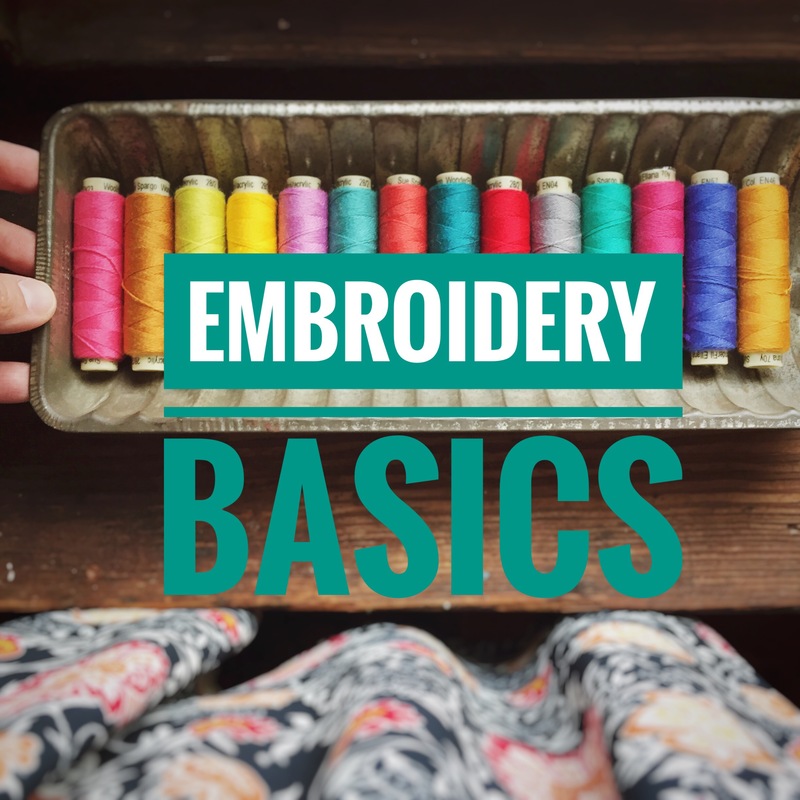 And if you are new to embroidery and want to learn the basics, check out my embroidery book, Boho Embroidery for everything you need to get started! 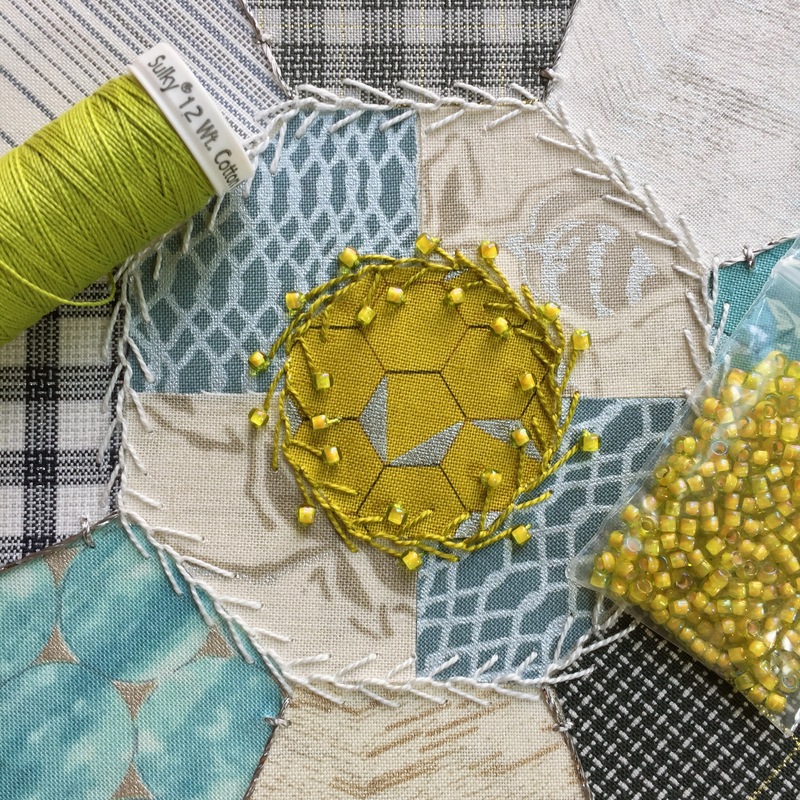 My stitch Along piece this week is a hoop that I am making as a gift for one of my boy’s teachers…a little late for teacher appreciation week, but it will be done soon! How cool is this fabric from Free Spirit Fabrics from the line, “Neptune and the Mermaid”?! 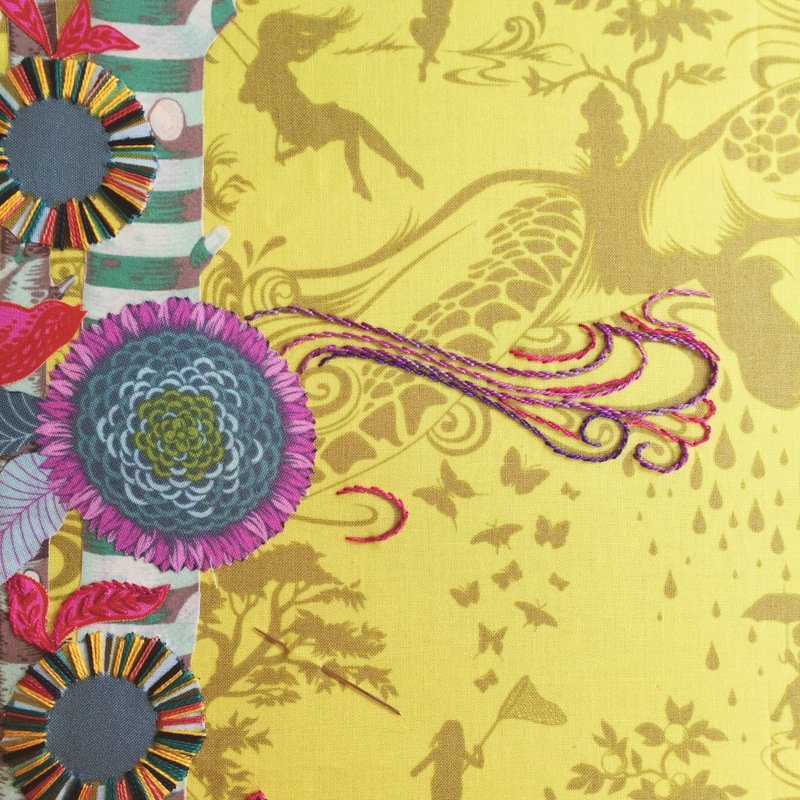 I saw this fabulous fabric online and just had to buy it immediately (from Circa 15 Fabric Studio). 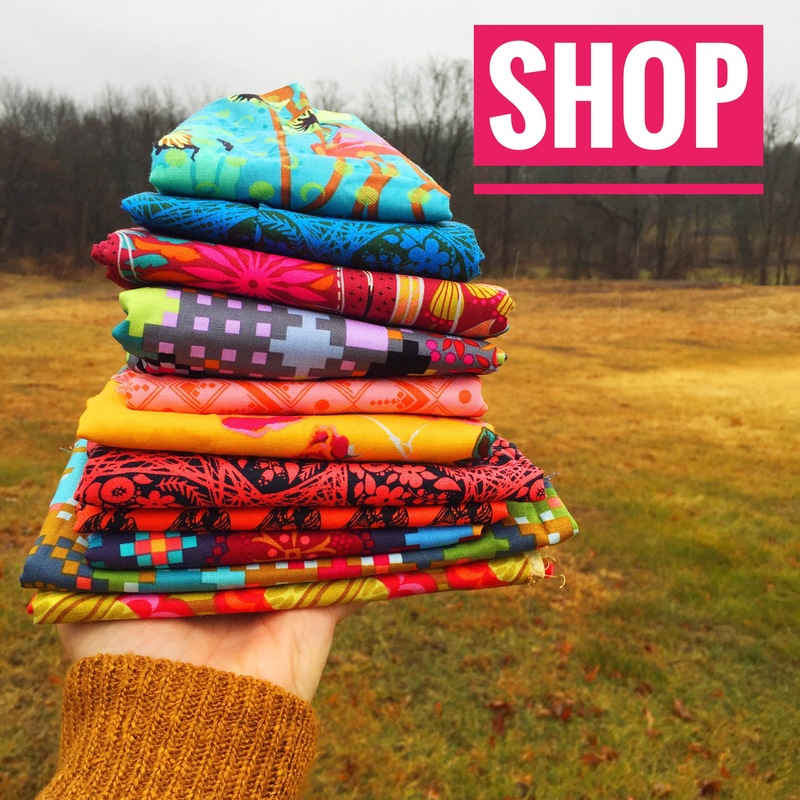 When I buy fabrics, I don’t typically buy large quantities…usually a fat quarter or a 1/2 yard works for most of my projects. 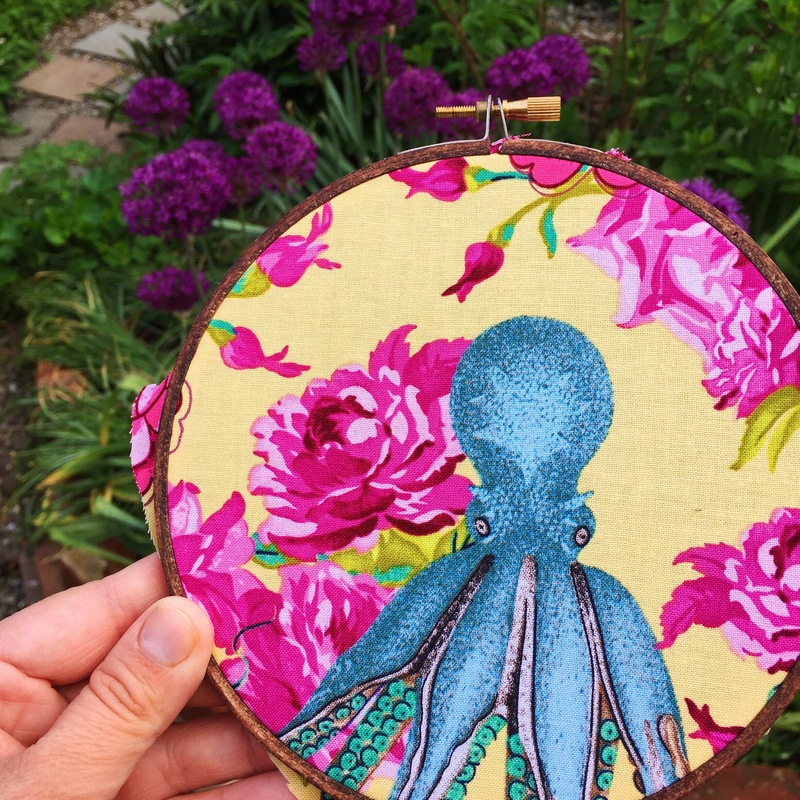 Not checking the size of this octopus, I quickly added a 1/4 yard to my cart and then added a few other things and then checked out. I couldn’t wait to open the fabric when it arrived. Sadly, I realized that, with this particular fabric, I should have ordered a larger cut because I didn’t get one complete octopus. 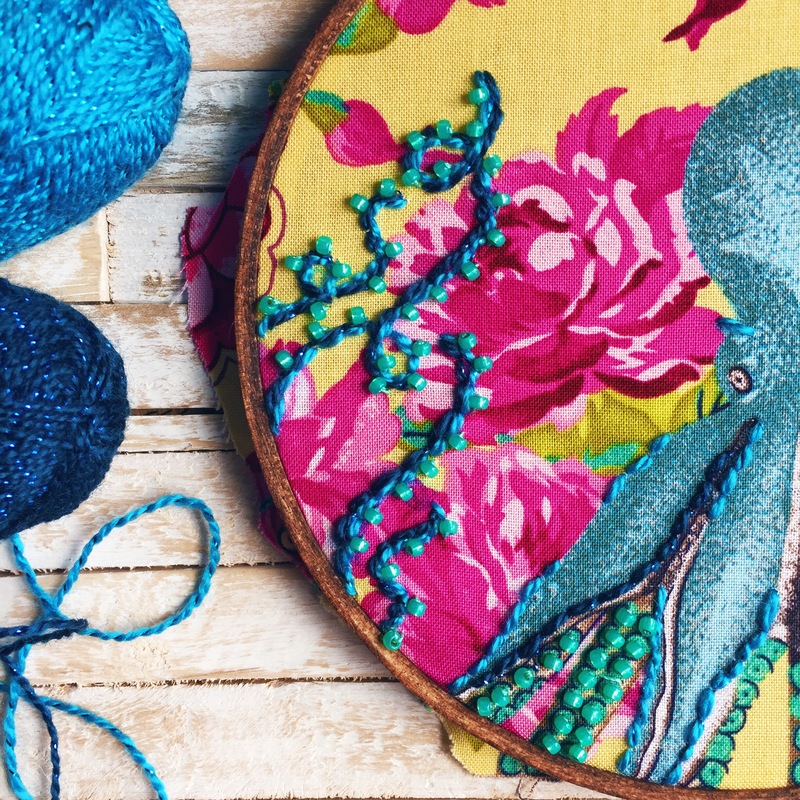 SO…if you like this one and want a complete octopus, don’t make my mistake and think you can get by with a 1/4 yard! Here’s how I’ve made lemonade out of my lemon-ish purchase! I’ve been using the Lion Brand bonbons and seed beads to add swirly octopus legs around the flowers on the fabric. I think it’s a pretty good fix, right?! And speaking of Octopi (because we were, right?! ), here’s another one I’ve been stitching. This one required lots and lots and LOTS of fussy cutting and another Free Spirit Fabric this one from Heather Bailey‘s “Hello Love” line. You’ll be seeing lots more from this one as I finish it off to send to Sue Spargo for Quilt Market this week! Speaking of purchases (because we were, right?! ), look at this beautiful trim! I have no particular project in mind for these, but I saw them and knew I had to have them for something! And speaking of Quilt Market (because we were, right?!) Here’s a detail shot of one of the hoops i’ve been making for Robert Kaufman’s booth with the upcoming Jennifer Sampou “Shimmer On” fabrics (coming out in August). Remember how I told you I love these Sulky 12 Wt. 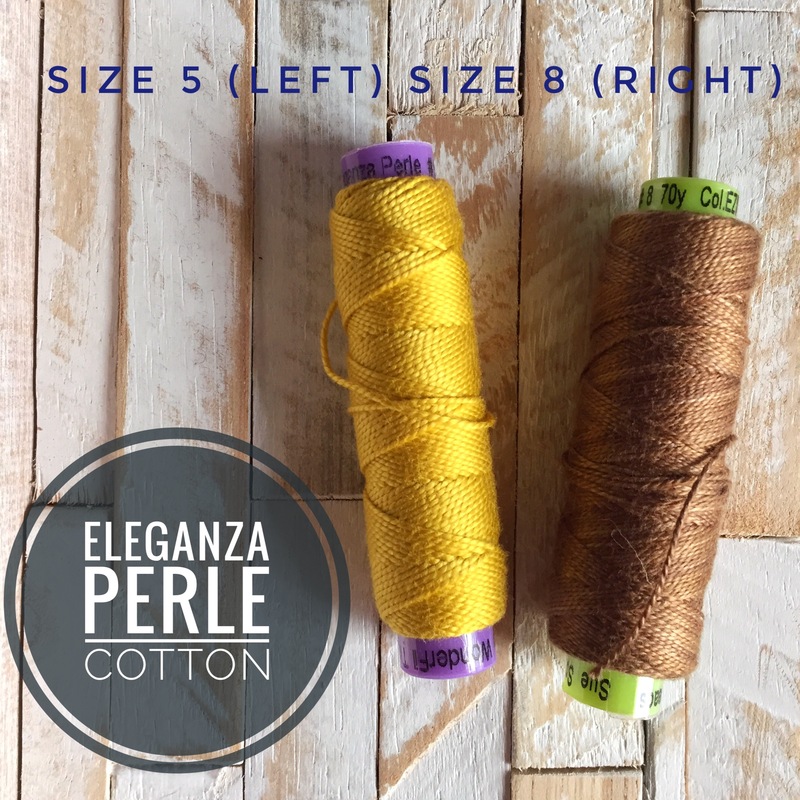 Cotton Petites? 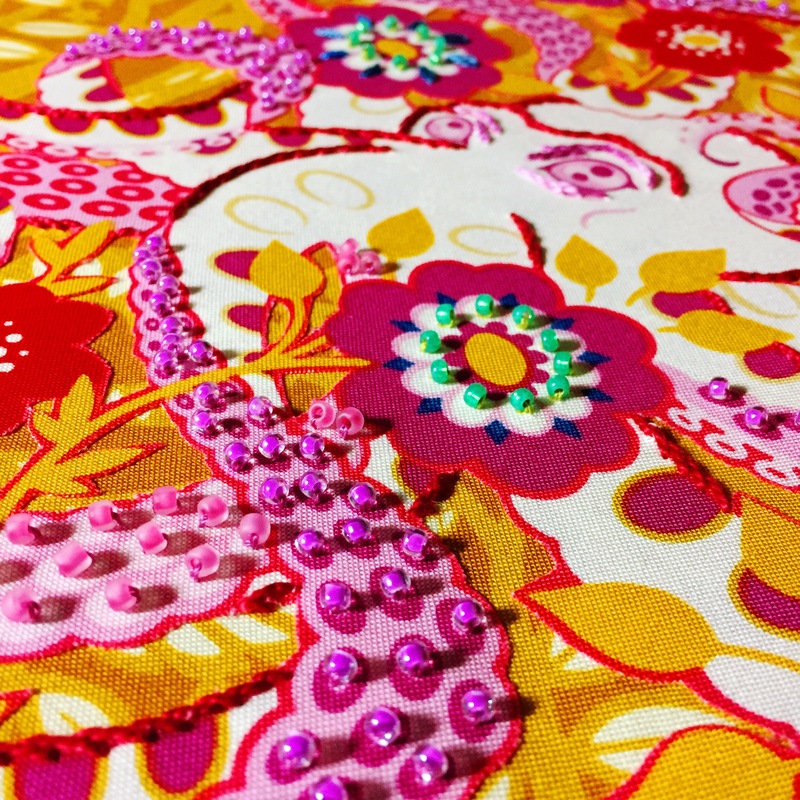 Well, this is what I love them for…they are brilliant for adding beads to my embroidery! They do not break (like when I tried to use just plain sewing machine thread) and you don’t have to separate threads (like when you use floss). I’ll post more pics of these hoops around Quilt Market time! And speaking of sneak peeks (because we were, right?!) 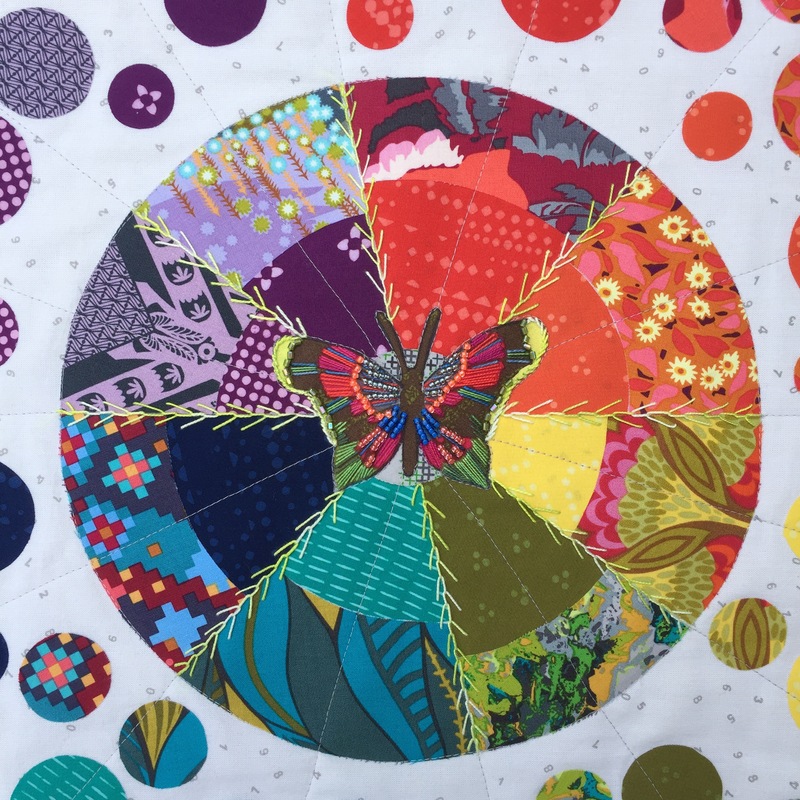 Here’s a peek at a mini quilt made with my Fractured Color Wheel Embroidery Pattern. I used some of my favorite Anna Maria Horner fabrics combined with so beautiful You and Me batiks. My mom (even though she told me not to give her any credit!) did the quilting and binding and everything else for me!) It turned out better than I was picturing!! How about that butterfly in the center?! So that’s this week all wrapped up! Hopefully your week was less jumbly and jam-packed than mine was (!) and that you have plenty of time for stitching in the coming week! Welcome back for Week no. 16! 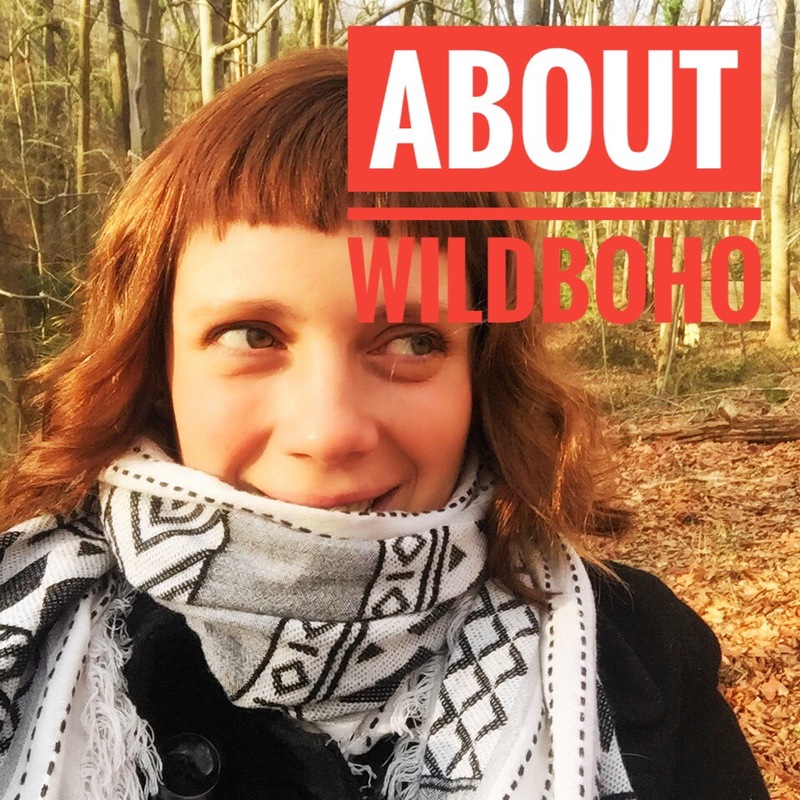 If you are just beginning a piece for the #BohoSAL, check out my previous posts here. 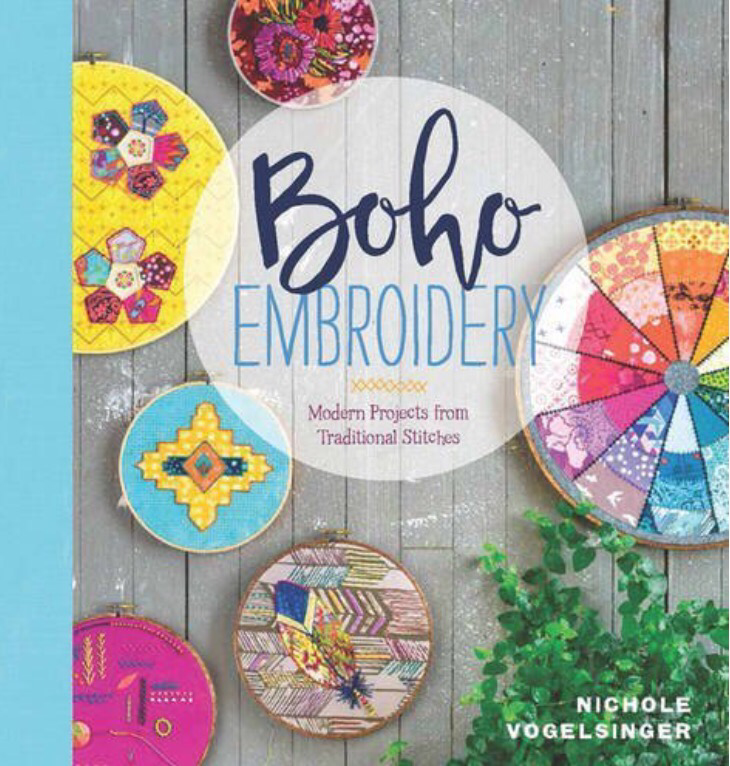 And if you are new to embroidery and want to learn the basics, check out my embroidery book, Boho Embroidery for everything you need to get started! Well, the stomach bug has hit our house hard this week, which means I did a whole lot of cleaning and disinfecting and then some more cleaning and disinfecting and not as much stitching as I had hoped!!! I did have wits enough to put together this Tula Pink piece that is slightly larger than I normally work with, though, and I am considering it my Boho Stitch Along piece for the week! This citron color is from Tula Pink’s Prince Charming line, which might just be one of my all-time favorites…I still have decent cuts of all of the color ways from this one! I also added elements from Acacia, Bumble and Slow and Steady. I found this lap embroidery hoop for a whopping $2.50 at the thrift store and picked it up even though I wasn’t sure if I would like using it. Let me tell you….I definitely like this hoop! For large pieces of embroidery, it is so handy to not have to hold the hoop while i’m stitching. I feel like I can stitch faster than if I were wrangling a large 14″ hoop while trying to stitch! 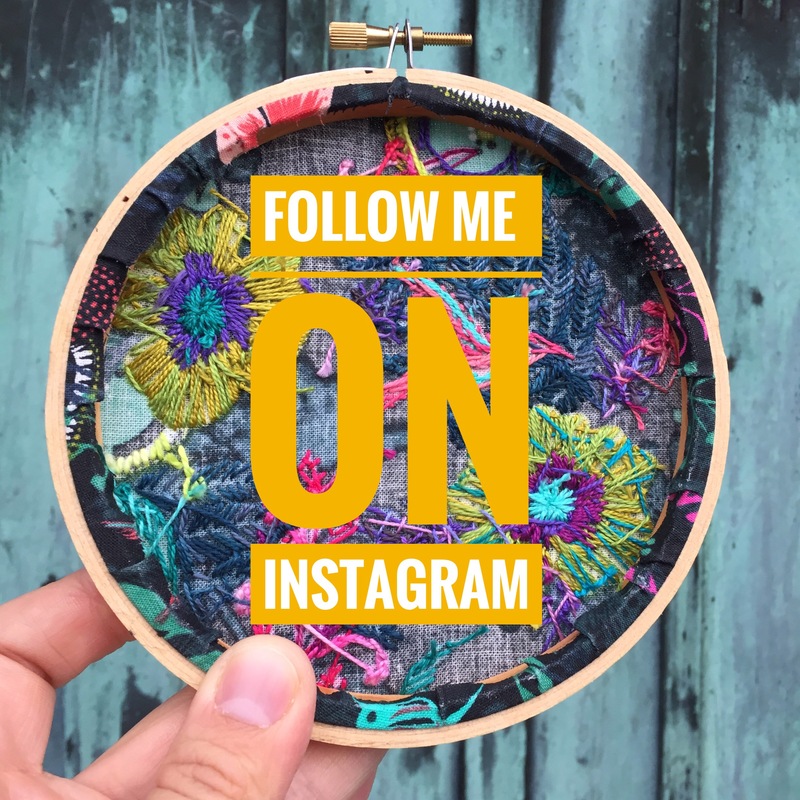 In non-Boho Stitch Along related posts, I want to tell you about a new (to me) thread that I have been using for the past week or so. 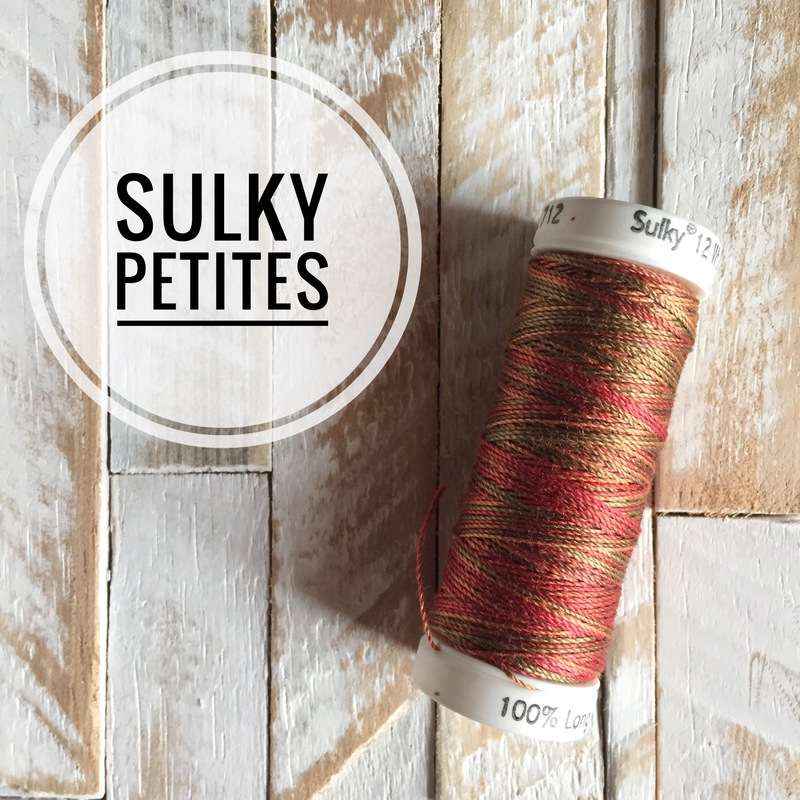 Sulky sent me a few things to try out and these Cotton Petites were among the samples. 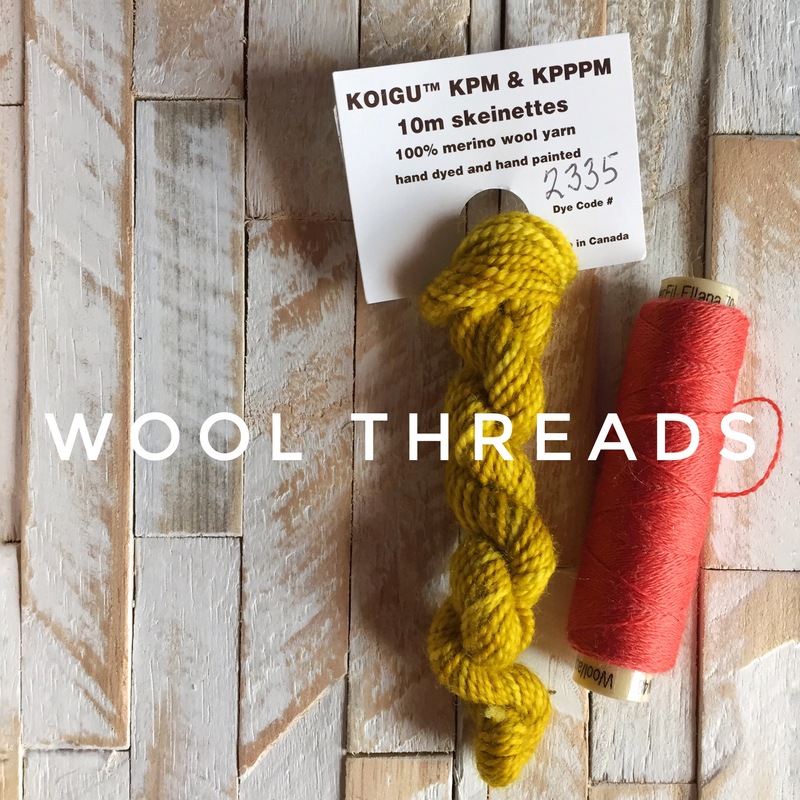 I am always game to try a new thread and I discovered that these threads work really great when I am adding beads to my embroidery. In the past, whenever I added beads, I just used sewing machine thread because I wanted something thin that wouldn’t take away from the embroidery. I would inevitably have to deal with tangles and it just never worked great. So when Sulky sent me this, a lightbulb went off and I was excited to use it with beads. Each spool has about 50 yards and is the thickness of about 2 strands of floss, but you don’t have to separate it…you heard me right! You can use it directly from the spool!!! I love when I can use a thread that doesn’t need to be separated because it lets me stitch more and work less!! I haven’t seen these in any craft stores that are local to me, but you can check them out at Sulky and they come in both solid and variegated (or bendable) colors. Have a great week stitching! !